DULUTH, GA - A fourth-quarter comeback bid fell short as the Saskatchewan Rush dropped a 13-10 decision to the Georgia Swarm in a Sunday matinee in suburban Atlanta. 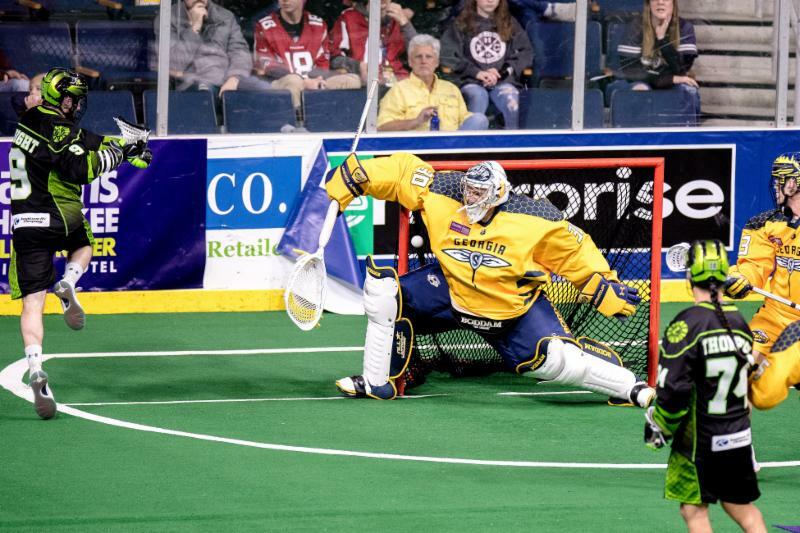 The loss brought an end to the Rush’s three-game winning streak, while the Swarm (5-2) were able to put a halt on a two-game losing skid. The Rush (3-2) fell behind 5-0 in the game’s opening minutes and trailed by five goals after the first, second and third quarters before mounting a comeback attempt in the fourth. Mark Matthews and Jeff Shattler scored 25 seconds apart in the opening minute of the final quarter to cut Georgia’s lead to three at 10-7. Shattler goal came as he grabbed a rebound and fired it in from the slot. The Swarm responded with two goals to retake a five-goal advantage, but the Rush weren’t about to go down without a fight. Marty Dinsdale pocketed his hat-trick tally to make it 12-8. Shattler was able to race down a loose ball in the offensive end then flick a pass to Dinsdale who put a laser behind Swarm goalie Mike Poulin. Less than two minutes later, Matthews collected his hat-trick marker as he cut into open space in the slot and put Dinsdale’s feed in. The Rush then closed the gap further, making it 12-10 as Matt Hossack went high to grab a loose ball, race down the floor, and use Dinsdale as a decoy before firing a shot past Poulin. The Rush continued to put the pressure on in search of getting even, but the Swarm held their own defensively and got an empty-netter from Connor Sellers with 1:08 to go to ice the victory. Georgia’s quick start to the game put the Rush in a deep early hole. The Swarm grabbed a 5-0 lead just over seven minutes in and Saskatchewan starter Evan Kirk was pulled in favor of Adam Shute. The Rush didn’t get on the scoreboard until Matthews’ first of the game 9:34 into the first quarter and they didn’t score again for over 19 minutes until Shattler made it 7-2 with just over a minute to go in the first half. Shattler wound up with a seven-point effort (2 goals, 5 assists) for the Rush, while Robert Church had the other goal and Ryan Keenan totaled four assists. While the Rush’s offence struggled until the final quarter, Shute turned in an admirable relief performance and finishing with 27 saves. The Rush have a quick turnaround heading into their next game on Friday night. They are on the road for a second straight week as they take on the Toronto Rock.